The NASA Neil A. Armstrong Flight Research Center (AFRC) is an aeronautical research center operated by NASA. Its primary campus is located inside Edwards Air Force Base in California and is considered NASA's premier site for aeronautical research. AFRC operates some of the most advanced aircraft in the world and is known for many aviation firsts, including critical support for the first manned airplane to exceed the speed of sound in level flight with the Bell X-1, highest speed ever recorded by a manned, powered aircraft (North American X-15), the first pure digital fly-by-wire aircraft (F-8 DFBW), and many others. AFRC also operates a second site in Palmdale, Ca. known as Building 703, once the former Rockwell International/North American Aircraft production facility, at Air Force Plant 42. There, AFRC houses and operates several of NASA's Science Mission Directorate aircraft including SOFIA (Stratospheric Observatory For Infrared Astronomy), a DC-8 Flying Laboratory, a Gulfstream C-20A UAVSAR and ER-2 High Altitude Platform. David McBride is currently the center's director. Edwards Air Force Base, California, U.S.
On March 1, 2014, the facility was renamed in honor of Neil Armstrong, a former test pilot at the center and the first human being to walk on the surface of the moon. The center was previously known as the Dryden Flight Research Center (DFRC) from March 26, 1976, in honor of Hugh L. Dryden, a prominent aeronautical engineer who at the time of his death in 1965 was NASA's deputy administrator. It has also previously been known as the National Advisory Committee for Aeronautics Muroc Flight Test Unit (1946), the NACA High-Speed Flight Research Station (1949), the NACA High-Speed Flight Station (1954), the NASA High-Speed Flight Station (1958) and the NASA Flight Research Center (1959). AFRC was also the home of the Shuttle Carrier Aircraft (SCA), a modified Boeing 747 designed to carry a Space Shuttle orbiter back to Kennedy Space Center if one landed at Edwards. Until 2004, Armstrong Flight Research Center operated the oldest B-52 Stratofortress bomber, a B-52B model (tail number 008) which had been converted to drop test aircraft, dubbed 'Balls 8.' It dropped a large number of supersonic test vehicles, ranging from the X-15 to its last research program, the hypersonic X-43A, powered by a Pegasus rocket. The aircraft was retired and is currently on display near the North Gate of Edwards. Though Armstrong Flight Research Center has always been located on the shore of Rogers Dry Lake Bed, its precise location has changed over the years. It currently resides on the North Western Edge of the lakebed, just south of Edwards Air Force Bases' North Gate. Visitation to the center requires obtaining access to both Edwards AFB and NASA AFRC. Rogers dry lake bed offers a unique landscape which is well suited for flight research. Dry conditions, few rainy days per year, and large, flat, open spaces in which emergency landings can be performed. At times, Rodgers dry lake bed can host a runway length of over 40,000 feet, and is home to a 2000' diameter compass rose, in which aircraft can land into the wind in any direction. NASA's predecessor, NACA, operated the Douglas Skyrocket. A successor to the Air Force's Bell X-1, the D-558-II could operate under rocket or jet power. It conducted extensive tests into aircraft stability in the transsonic range, optimal supersonic wing configurations, rocket plume effects, and high-speed flight dynamics. On November 20, 1953, the Douglas Skyrocket became the first aircraft to fly at over twice the speed of sound when it attained a speed of Mach 2.005. Like the X-1, the D-558-II could be air-launched using a B-29 Superfortress. Unlike the X-1, the Skyrocket could also takeoff from a runway with the help of JATO units. A remotely piloted Boeing 720 is destroyed in the Controlled Impact Demonstration. The Controlled Impact Demonstration was a joint project with the Federal Aviation Administration to research a new jet fuel that would decrease the damage due to fire in the crash of a large airliner. On December 1, 1984, a remotely piloted Boeing 720 aircraft was flown into specially built wing openers which tore the wings open, fuel spraying everywhere. Despite the new fuel additive, the resulting fire ball was huge; the fire still took an hour to fully extinguish. Even though the fuel additive did not prevent a fire, the research was not a complete failure. The additive still prevented the combustion of some fuel which flowed over the fuselage of the aircraft, and served to cool it, similar to how a conventional rocket engine cools its nozzle. Also, instrumented crash test dummies were in the airplane for the impact, and provided valuable research into other aspects of crash survivability for the occupants. A modern Skunk Works project leverages an older: LASRE atop an SR-71 Blackbird. LASRE was a NASA experiment in cooperation with Lockheed Martin to study a reusable launch vehicle design based on a linear aerospike rocket engine. The experiment's goal was to provide in-flight data to help Lockheed Martin validate the computational predictive tools they developed to design the craft. LASRE was a small, half-span model of a lifting body with eight thrust cells of an aerospike engine. 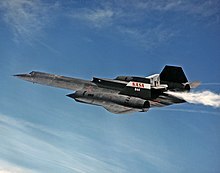 The experiment, mounted on the back of an SR-71 Blackbird aircraft, operated like a kind of "flying wind tunnel." The experiment focused on determining how a reusable launch vehicle's engine plume would affect the aerodynamics of its lifting body shape at specific altitudes and speeds reaching approximately 750 miles per hour (340 m/s). The interaction of the aerodynamic flow with the engine plume could create drag; design refinements look to minimize that interaction. The Lunar Landing Research Vehicle or LLRV was an Apollo Project era program to build a simulator for the Moon landing. The LLRVs, humorously referred to as "Flying Bedsteads", were used by the FRC, now known as the Armstrong Flight Research Center, at Edwards Air Force Base, Calif., to study and analyze piloting techniques needed to fly and land the Apollo Lunar Module in the moon's airless environment. ^ a b Conner, Monroe (2015-02-19). "Building 703 Facilities Overview". NASA. Retrieved 2017-09-26. ^ Gibbs, Yvonne (2015-08-12). "NASA Armstrong Fact Sheet: First Generation X-1". NASA. Retrieved 2017-09-26. ^ "Aerospaceweb.org | Aircraft Museum - X-15". www.aerospaceweb.org. Retrieved 2017-09-26. ^ Gibbs, Yvonne (2015-08-13). "NASA Armstrong Fact Sheet: X-15 Hypersonic Research Program". NASA. Retrieved 2017-09-26. ^ Gibbs, Yvonne (2017-05-10). "F-8 Digital Fly-By-Wire". NASA. Retrieved 2017-09-26. ^ Conner, Monroe (2015-02-19). "Builiding 703 in Palmdale". NASA. Retrieved 2017-09-26. ^ "New Dryden Director: Administrator Bolden Selects David McBride". NASA. 2010-01-15. Retrieved 2010-02-15. ^ "NASA Center Renamed in Honor of Neil A. Armstrong". NASA. ^ "NASA Honors Astronaut Neil Armstrong with Center Renaming". NASA Press Release 14-061. 28 February 2014. ^ "What's In a Name". NASA. 2014-02-27. Wikimedia Commons has media related to Armstrong Flight Research Center.